The list has not been updated since about June 2017. We are working on a more sophisticated list; stay tuned. The FPC publishes a limited set of details of forthcoming public hearings on its website. The following table is a continuously updated list of all public hearings announced by the FPC — incl. not only the forthcoming hearings, but also the hearings of the past. As always, it is aimed to keep the information hereinbelow complete and correct; however, please do not forget to doublecheck with the details indicated directly on the website of the FPC when you plan to attend a hearing. 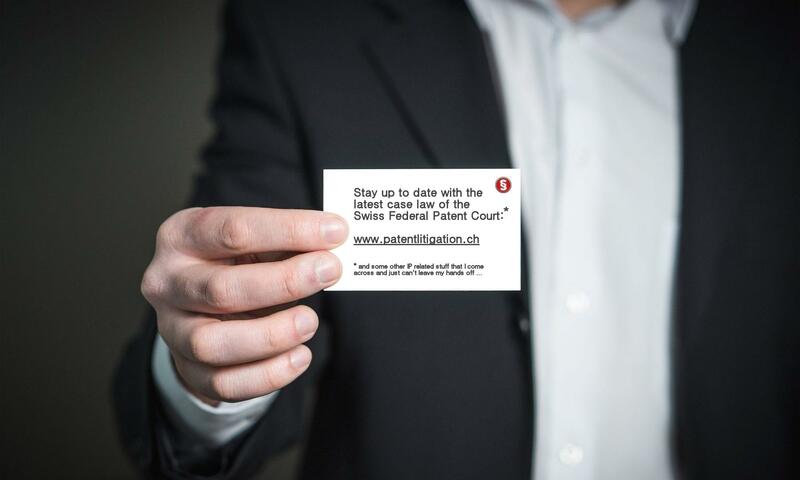 Moreover, please note that hearings in St. Gall are still taking place at the Federal Administrative Court at Kreuzackerstrasse 12, 9000 St. Gall (Google maps), not directly at the seat of the Federal Patent Court. 2016 12 13 10:00 am FAC O2015_004 Pharma Decl. judg. 1 Security check at the entrance. 2 Cf. earlier posts in this matter: 2012 05 03, 2012 07 31, 2013 01 16. The hearing had been cancelled on July 5, 2013. 3 This hearing did not show up anymore on a schedule published by the FPC on April 8, 2013. Presumably, the hearing was cancelled. 4 This hearing did not show up anymore on a schedule published by the FPC one day before the scheduled hearing, i.e. on April 24, 2013. Presumably, the hearing was cancelled. 5 Cf. a post in this matter here. 6 Cf. a post in this matter here. 7 Cf. a post in this matter here. 8 The hearing of October 21, 2013 did not show up anymore on a schedule published by the FPC on October 18, 2013. Presumably, the hearing had been cancelled and re-scheduled for November 29, 2013. On a schedule published by the FPC on November 25, the hearing of November 29 did not show up anymore, either. 9 Cf. a post in this matter here. 10 Cf. a post in this matter here. 11 This hearing has been cancelled on April 07, 2014. 12 Cf. a post in this matter here. 13 Cf. a post in this matter here. 14 This hearing did not show up anymore on a schedule published by the FPC on March 24, 2015. Presumably, the hearing was cancelled. 15 This hearing was cancelled (notification on the internet on December 11, 2015). 16 This hearing was cancelled (notification on the internet on December 09, 2016). 17 This hearing was cancelled (notification on the internet on March 06, 2017).